In an email one Nick Weaver asked me if I would like to write a review of his product, my newly purchased eero system wifi extender. He asked me in an email yesterday. So I don’t mind. It seems to work fine. I suspect that Nick, “Co-founder and CEO, https://eero.com” is hoping that I would write a good review. And he can be pretty fairly comfortable asking because I had answered his earlier email questionnaire a week ago. My response was conveniently abridged in 5 easy button selections. And all my selections were all positive. I checked all with the 5 button indicating “Very Satisfied” buttons in all cases I pressed SEND. Yep, I’m a pretty satisfied customer. Somehow I keep forgetting the product name though. Is it aaro or is it eero? Are business running out of name choices? When it grows up will it use a capital letter? Is this a “branding” issue Nick? No biggie. Bet Nick doesn’t send any followup requests to the guys who are unsatisfied in even one of 5 categories found in the customer opinion email. So I am pretty much a sure thing. Let’s see if he is satisfied by this. Really, getting good reviews is tuff as we all know it is easier to want to complain about something you bought than send a nice message for positive results. I think it’s something like 8 times more likely that a complaint will be sent than a good review on a product purchase. Somehow Amazon.com has figured out a way to defeat this human trait, apparently. Then again, maybe Nick has only satisfied customers. Wouldn’t that be nice. You know Kick gave me the chance to start the day in a positive way and I’m pretty sure I didn’t kick a cat at any time that morning. Thanks Nick. This aaro system has been working out just fine at home since I installed it. I only needed to call tech support on a Sunday morning and a very nice person answered and guided me until I realized that I had forgotten to select my new WiFi network. 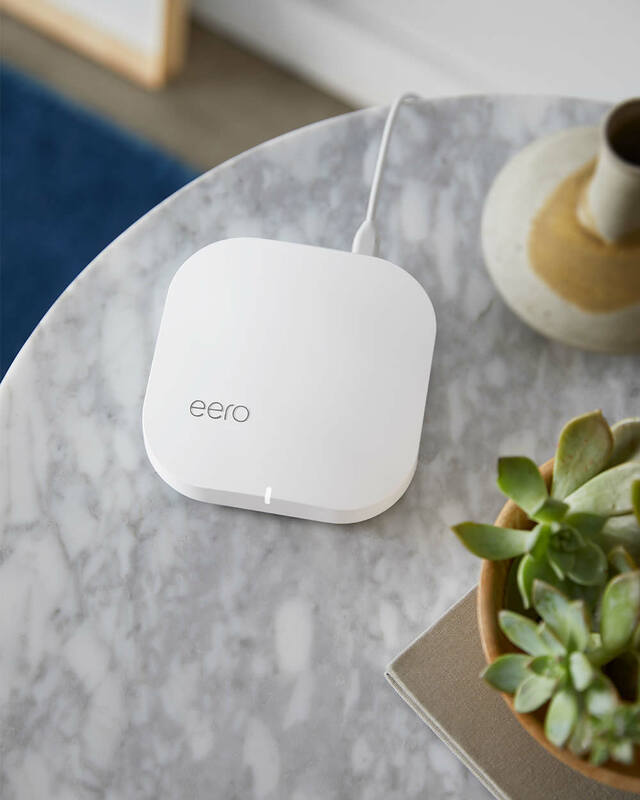 Tip: always makeup a new name for the new network that eero makes. Could be confusing later, otherwise. The old WiFi network was weaker and wouldn’t range into the back bedroom well. Checking email in bed was “such a problem!” So, after being reminded, I clicked on the WiFi symbol at the top of the screen to select my newly setup network. Of course I had named it differently. It was the step that I had forgotten and it was a cinch, after it was pointed out. Thanks Sunday morning guy. aaro info (advertising) suggests that you buy the 3 unit system (called an eero and two eero Beacons) to reach around all corners in a 1,500 sq. ft. house or office. At over $300 thats a lot of money spent for buying a lot of invisible waves that might be here or might be there, or not. But the aero app shows great power everywhere so now I don’t have to get out of bed. And bonus, I can even download to my laptop while it’s in my back yard. I need a hammock. MY REVIEW, it’s working fine. Satisfied customer.